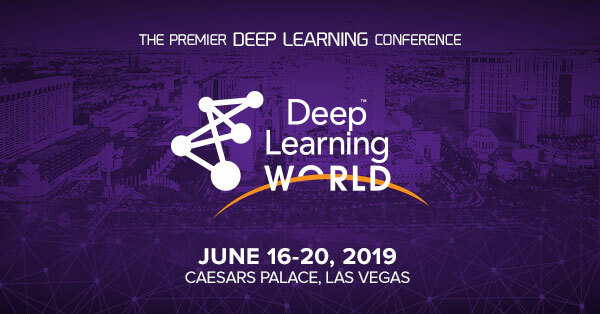 Deep Learning World 2019, Jun 16-20 in Las Vegas, will cover a good portion of the wide range of deep learning application areas. Regular prices available until Apr 26. Register now! Deep learning is white hot – both in buzz and in value. These advanced methods scale machine learning to a new level of capabilities – namely, achieving high performance for large-signal input problems, such as for the classification of images (self-driving cars, medical images), sound (speech recognition, speaker recognition), text (document classification), and even “standard” business problems, e.g., by processing high dimensional clickstreams. Lead by Founding Chair Luba Gloukhova, Deep Learning World’s mission is to foster innovations in the value-driven operationalization of established deep learning methods and help catalyze deep learning’s commercial deployment. Hot applications of deep learning: Deep Learning World 2019 will cover a good portion of the wide range of deep learning application areas, including autonomous vehicles, computer vision, speech recognition, manufacturing, fake news detection, document classification, insurance underwriting, economic forecasting, aging research, language generation, sensitive content detection, fraud protection, network security, and automated marketing. Use the code KDNUGGETS for a 15% discount on your Deep Learning World ticket. For today and tomorrow’s deep learning methods and technology, attend the conference and training workshops at Deep Learning World in Las Vegas, June 16-20. Deep Learning World is part of Mega-PAW with five (5) parallel events amounting to seven (7) tracks: PAW Business, PAW Financial, PAW Healthcare, PAW Industry 4.0, and Deep Learning World.